It’s finally here! Season three of Top Stitchers started a few weeks ago, but I’ve been eagerly awaiting my challenge week. Well it’s Tuesday and “on Tuesdays we Top Stitch,” so without further ado…. To me, the prompt of using a homophone pair to inspire a look was super fun. Of course there are discrepancies about homophones vs homonyms vs homographs, but for the love of the game we’re counting them all under the same umbrella. I started going through some lists of homonyms and I found peek/peak right away and ran away with it! This post contains affiliate links which means if you click through and then purchase something Call Ajaire may get a small percentage of the sale. 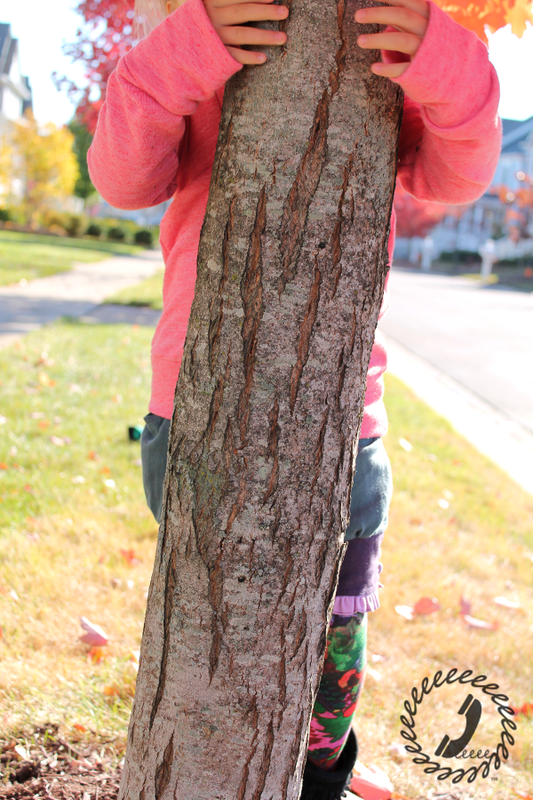 As sewing bloggers, we are used to posting “sneak peeks” of an outfit on social media. I swear every time I type sneak peek I want to write sneak peak so it was the perfect homonym pair for me to choose. If you search #sneakpeek on instagram you’ll find a ton of sewing in progress posts. 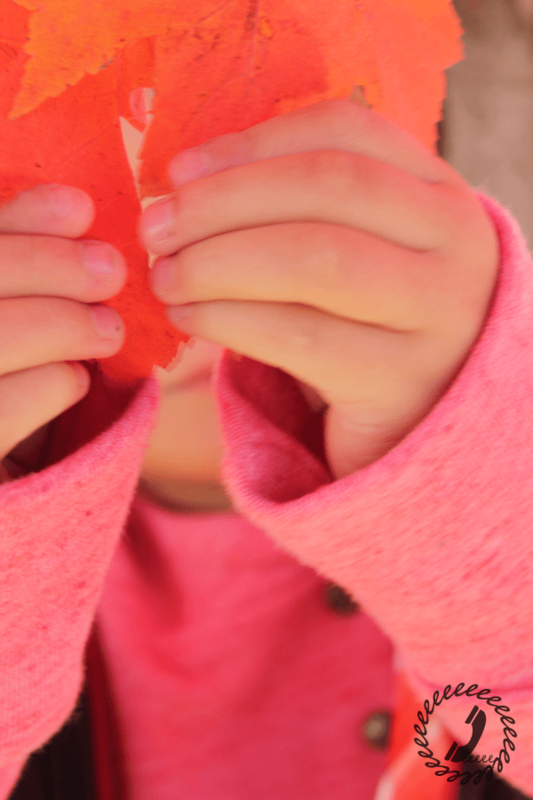 For the “peak” portion of the pairing I was inspired by autumn leaves at their peak color. All those deep reds, purples, yellows, and oranges make me so happy and are the reason that fall is by far my favorite season. Here in Maryland we’re right at the peak of color and even on a cold dreary day it’s gorgeous enough to make you stop in your tracks. I’ve had this knit print from JoAnn Fabrics in my stash for ages and it was the first thing I grabbed once I had my inspiration words. The trees and leaves in the design are the perfect colors to represent the peak of color. 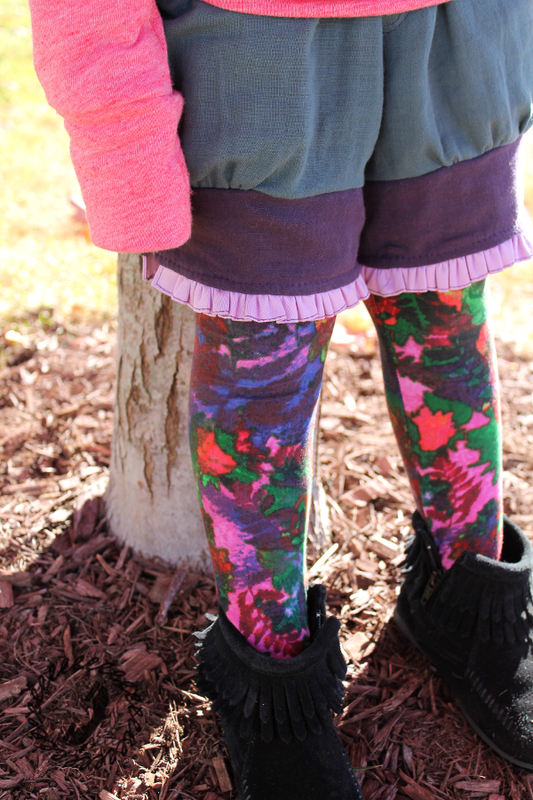 Now that I had a color story, I used the fabric to make a pair of The Wolf and Tree’s brand new Abby’s Trailblazing (*affiliate link) socks pattern in the thigh high length and am completely in love with them. I added a bit of elastic at the yoga cuff and these stay up even after hours of play. 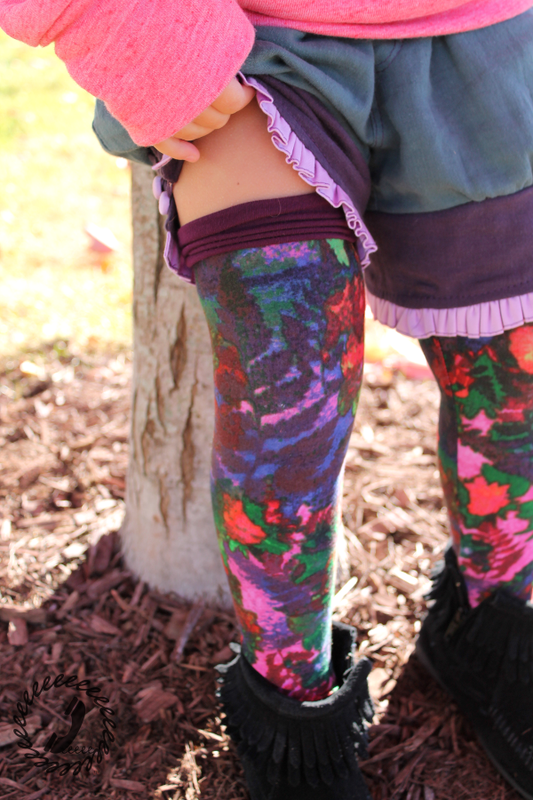 If you don’t have her socks or tights pattern yet, go run and get them (*affiliate link). They are both on sale on UpCraft Club right now and the socks are perfect for knit scrapbusting. The rest of the outfit came right together from my stash. I hacked and hacked in my head until I had three more pieces to make up the complete look. I made sure there were names that were part of a homonym pair involved in all three. Let’s start with the cropped vest. I spent time in France during college and one of my favorite phrases I picked up was “ca pique!” This means it’s spicy and any time I ordered a kabab and asked for the spicy sauce, the guy would say “ca pique!” as a warning and it cracked me up. So as a tribute I used “pique” as a third homonym to the peek/peak pair by hacking the All Spice Dress from Paisley Roots into a cropped vest. Get it? All SPICE? hehe. 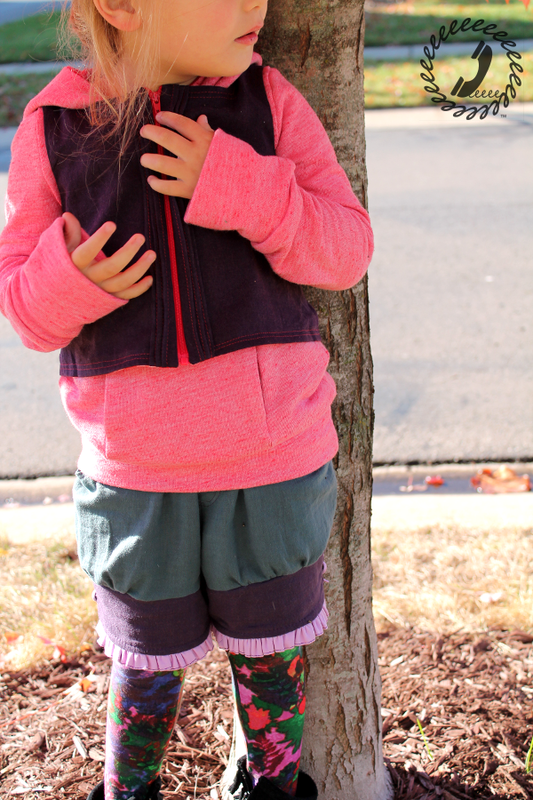 Anyway, ages ago I saw a cool vest hack of the pattern and I’d been dying to try it for my girl. It’s hard to see the tiny pleat details going down the front of the vest in the pics, but in person they along with the square neckline really make the vest stand out. I used this purple Brussels Washer Linen (*affiliate link) from Imagine Gnats and a red plaid that I’ve had in my stash for ages and I love how they look together. I’m not used to using so much red for Bean, but by adding a little purple for my purple loving girl it’s been fun to mix things up a bit. 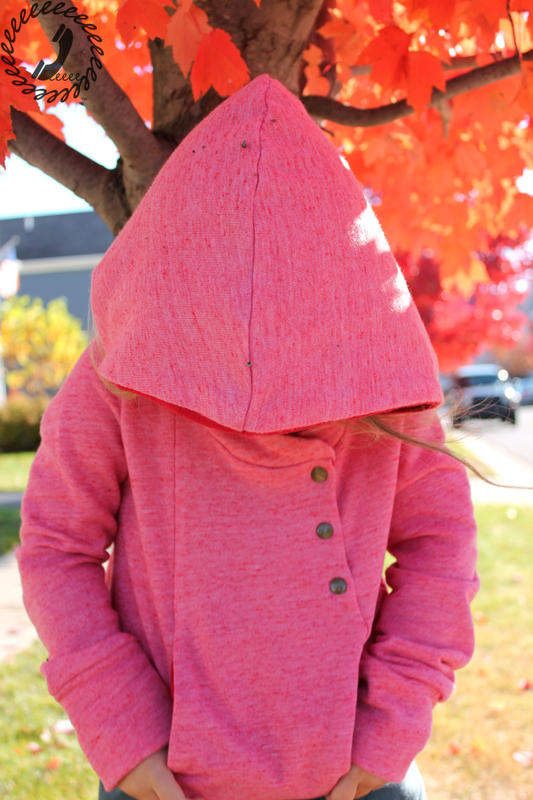 Speaking of reds, the hoodie is just the perfect combo of red and pinks. 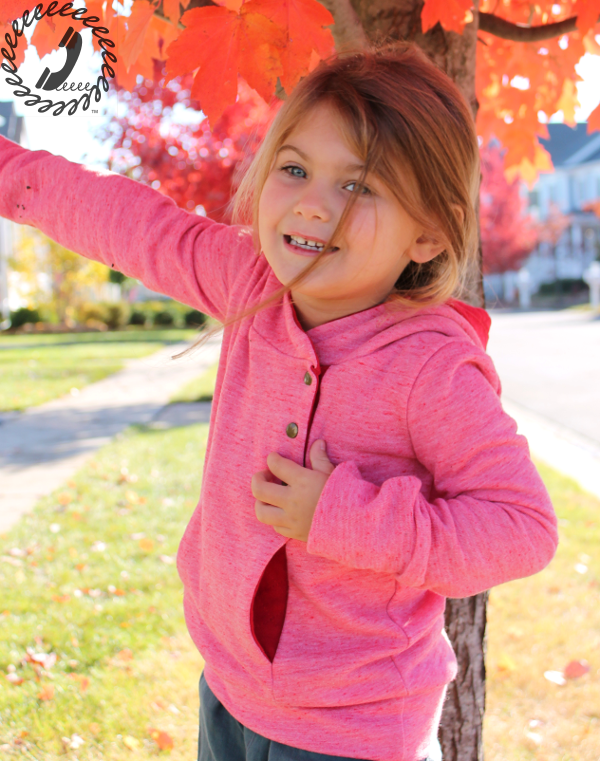 The main fabric is stretch french terry in this gorgeous heathered red (*affiliate link) colorway from Imagine Gnats. It’s so soft and perfect for a sweatshirt and I have to say I’m a little jealous that I used it for Bean instead of me. I’m crossing my fingers I have enough in my stash left over to make something for myself though. 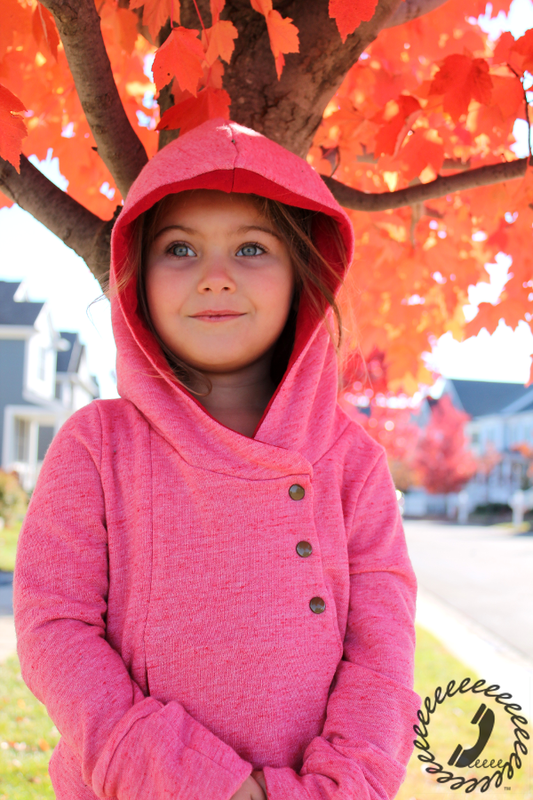 The hoodie is a mashUp of the Peek A Boo Hoodie by Lil Luxe Collection and the Hyde Park Hoodie by Peek a Boo Patterns Huge THANKS to Amy from Peek a Boo Patterns for donating the Hyde Park Hoodie pattern. 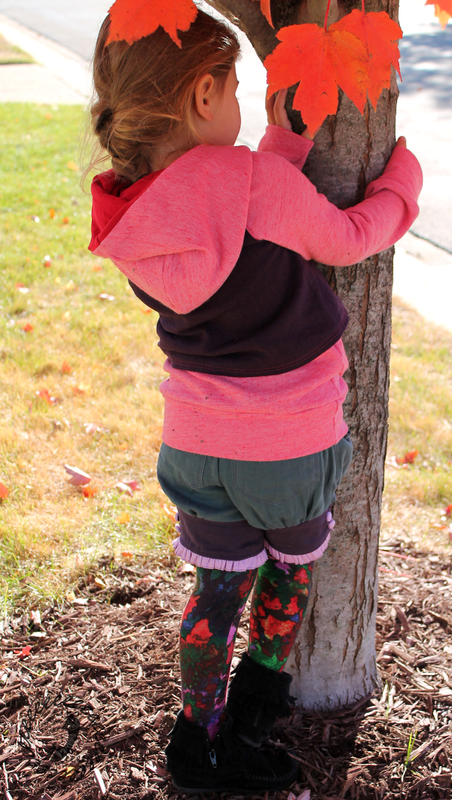 So Peek a Boo mashed with Peek a Boo, but the key to the peak portion of the hoodie is the snap placket I added. 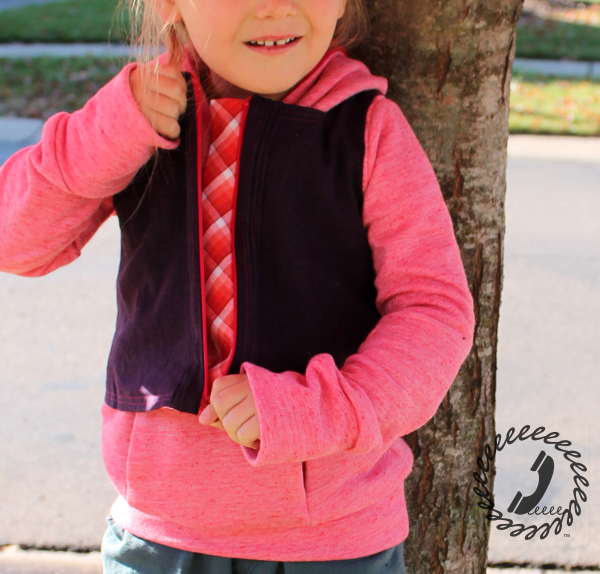 I used the idea of the asymmetrical Hyde Park zipper to make a snap placket on the peek a boo hoodie. Since the Hyde Park Hoodie is meant for adult sizes AND has a full length zipper without a placket, I had to do some creative designing, but I love how it turned out. 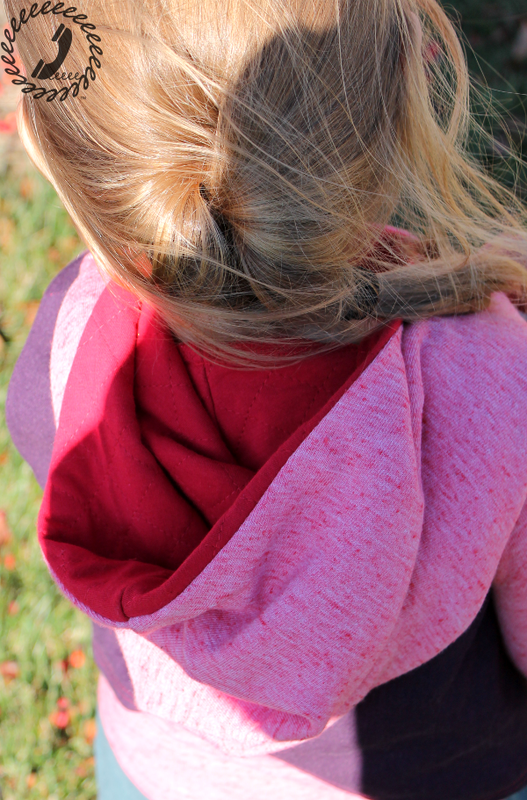 The original Peek a Boo Hoodie pattern has a neck that is wide enough that it doesn’t need any closures, but I really wanted a functioning snap placket detail on this hoodie. I angled the placket from the kangaroo pocket in toward the center of the neckline resembling the side of a mountain peak. This meant adding placket pieces and redoing the hood to fit a different (open) neckline, but it turned out just right. The kangaroo pocket is constructed in a way that made adding a placket a little crazy, but in the end all my measurements and tracing paper mock ups meant it went together cleanly and even looks nice from the inside. This sweatshirt will hopefully be a staple through the winter so I wanted every detail to look just right. 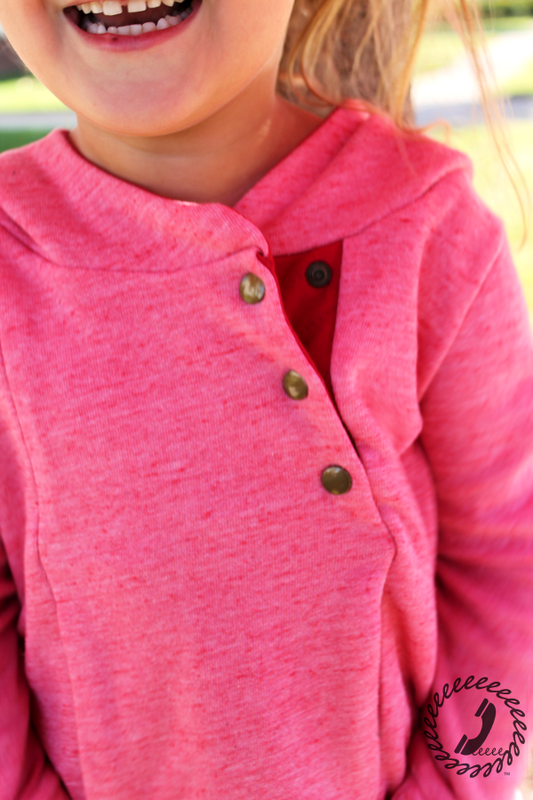 Those snaps in the placket are from I Like Big Buttons on Etsy and I can’t recommend her shop enough. There was an issue (on our post office’s end) with the shipping and she was more than happy to go the extra mile to get them to me. I will for sure be buying more supplies from her. Don’t forget that if you buy something from Etsy you can click through your Ebates (*affiliate link) to get cash back! The lining fabric is a quilted jersey. I quilted the jersey myself since I didn’t have any on hand and didn’t want to purchase anything new for this project. 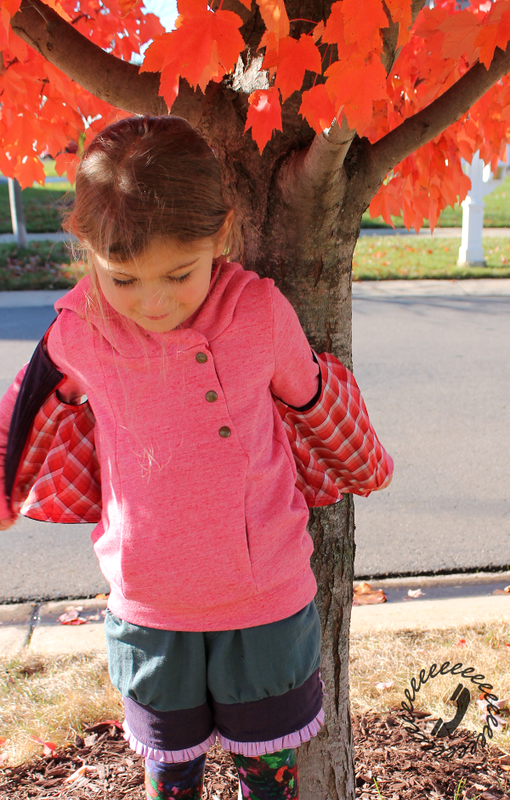 The jersey is the Laguna Cotton Jersey (*affiliate link) from Imagine Gnats and it is by far my favorite staple knit for tees. Remember this shirt and this one? They have been worn over and over and washed in the most ridiculous of settings and I haven’t had any pilling or fading. So even though it took some time to quilt pieces big enough for the giant hood, plackets, and pocket linings I am confident the jersey will hold up to lots of wear. 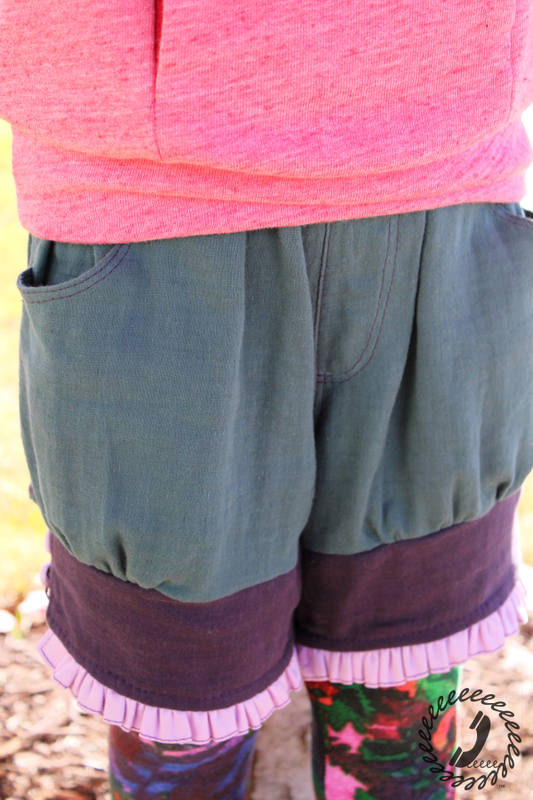 So as in love with the other pieces as I am, the shorts are pretty spectacular. The main pattern is from the Kids Clothes Sewing Lesson (*affiliate link) Japanese pattern book, view E-2. I love the look of the original shorts and they are called the Balloon Shorts once translated. Since balloon can mean both the object itself AND to puff up I thought it was the perfect excuse to finally make these shorts for this challenge. I love sewing Japanese patterns and have a couple more planned for November, but these had been on my list for over a year. I made them up in size 110 metric which should be great to fit her all next summer too. She’s really more in between 100 and 110 now so I’m very happy with the fit. They are a little baggy, but that’s part of the style and the detail stitching makes them look almost professional. 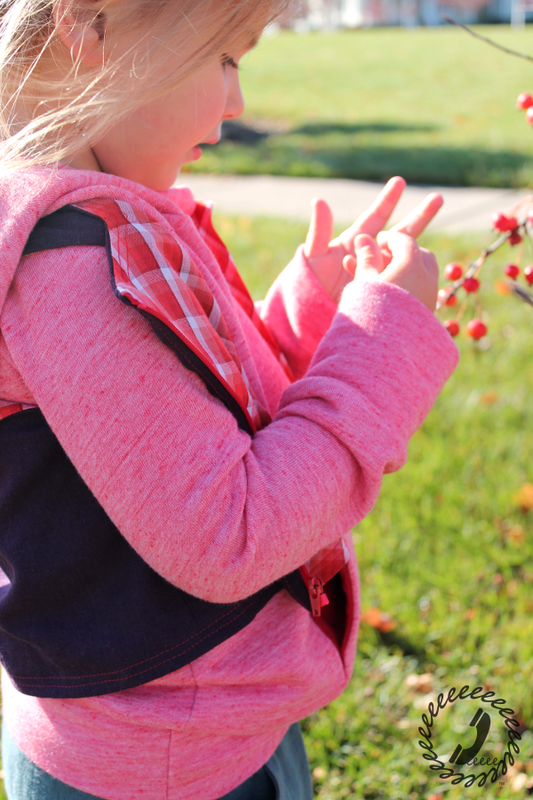 I used blueish double gauze (*affiliate link) from Imagine Gnats so these are perfect for summer AND for layering this winter. 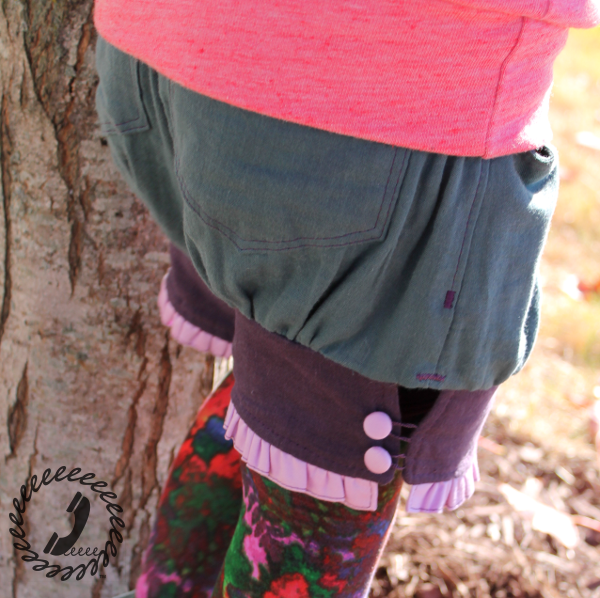 The gauze has an airy feel that adds to the “balloon” theme of the shorts pattern and the color resembles a blue spruce tree which is one of my favorites when standing next to all of the bright autumn colors so it HAD to be a part of this peak color inspired look. I used the Right Off The Cuff project from Anna Maria Horner’s Seams to Me (*affiliate link) book to change up the cuffs of the shorts. Though her project is intended to be a stand alone wrist cuff, I thought it’d be cute mashed with the balloon shorts and since right/write fulfills my homonym requirement I went with it. The purple is more double gauze from Imagine Gnats from the stash and the covered buttons and orchid colored ruffles are from the last bits of this gorgeous sateen (*affiliate link) from Organic Cotton Plus.